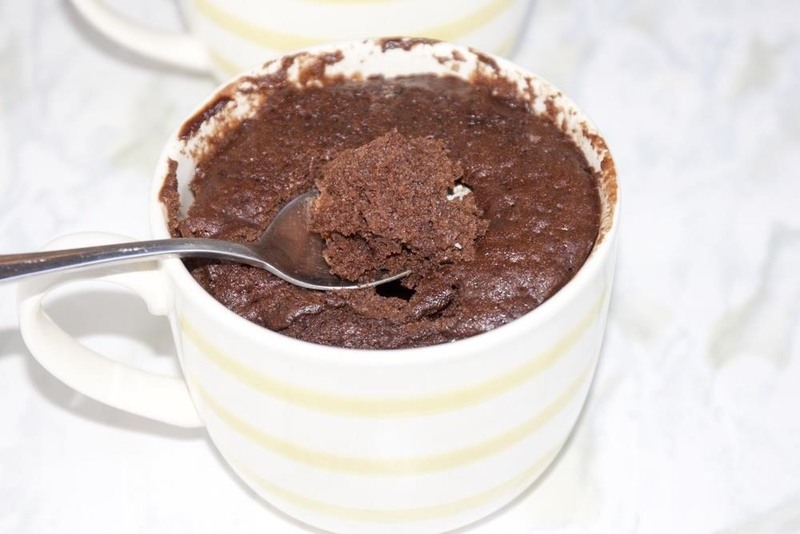 There are countless recipes for mug cakes (and breads) on the internet, but not all of them are good. Mug cakes promise a warm, moist, and fluffy cake after a few minutes and with minimal work... but sometimes, all you end up with is a chewy, rubbery mess. 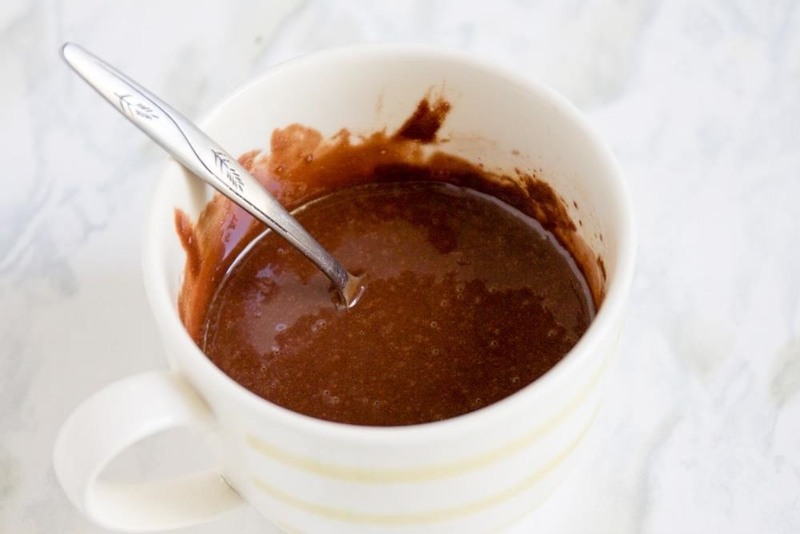 Well, mug cakes are a guilty pleasure of mine, and after quite a few attempts, I've found some great tricks to making each one perfect. Follow along with my ingredients or use any recipe you prefer (check out our favorites at the bottom of this post). 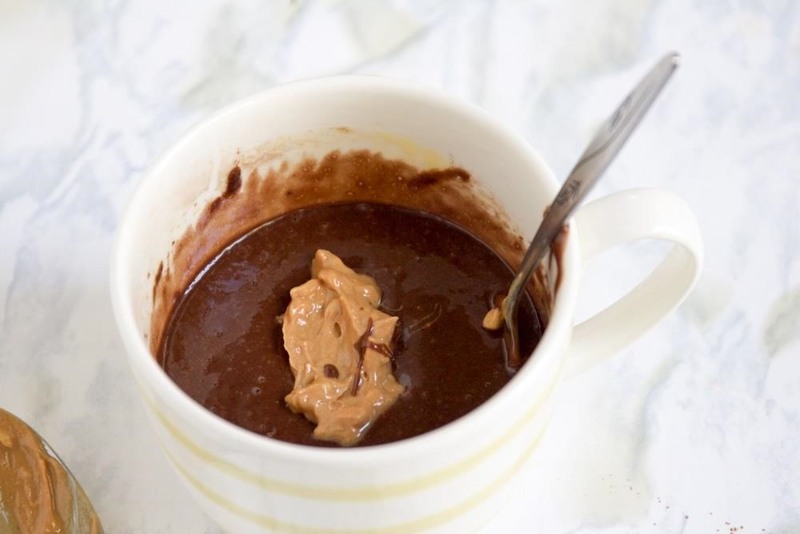 Add the dry ingredients in a large wide mug or small, microwave-safe bowl. Avoid using tall and skinny mugs, as they make it difficult for the cake to cook evenly in the microwave. The dry ingredients from just about any recipe will consist of flour, sugar, salt, and baking soda. 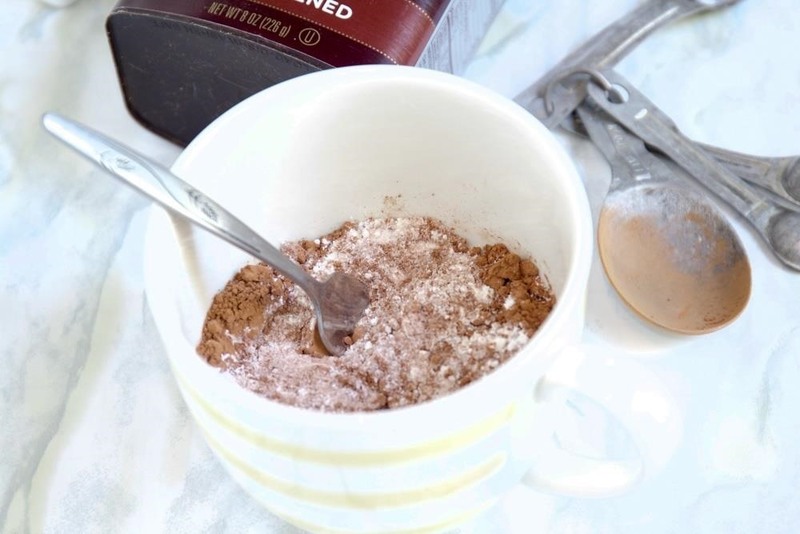 If you are making a chocolate mug cake, you'll mix in cocoa powder at this point, as well. Butter always makes things better—and ain't that the truth! Even if your recipe calls for oil, I recommend using melted butter instead. Butter gives the cake a lighter and fluffier texture than oil will. The unfortunate rubbery texture of some mug cakes usually comes from either too much oil or from overcooking the cake itself. Most recipes call for some sort of milk as well. I prefer almond milk, but you can use any milk (or milk alternative) you prefer. 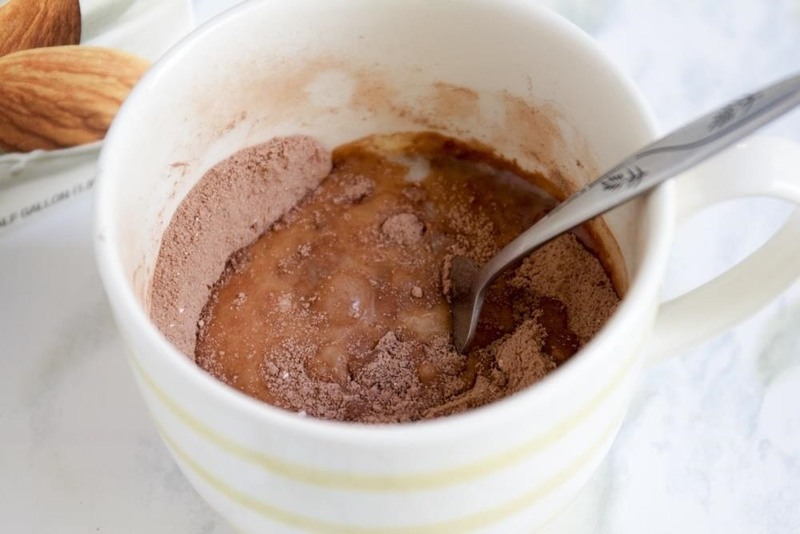 A lot of mug cake recipes omit the egg and use baking soda, baking powder, or both, to leaven and firm the cake the way an egg does, but I encourage you to add an egg in addition to the soda or powder anyway, since it'll make the mug cake much richer. When you do add an egg, make sure to mix, mix, and mix some more! If you don't stir aggressively, you'll have tiny bits of cooked egg whites in your cake. 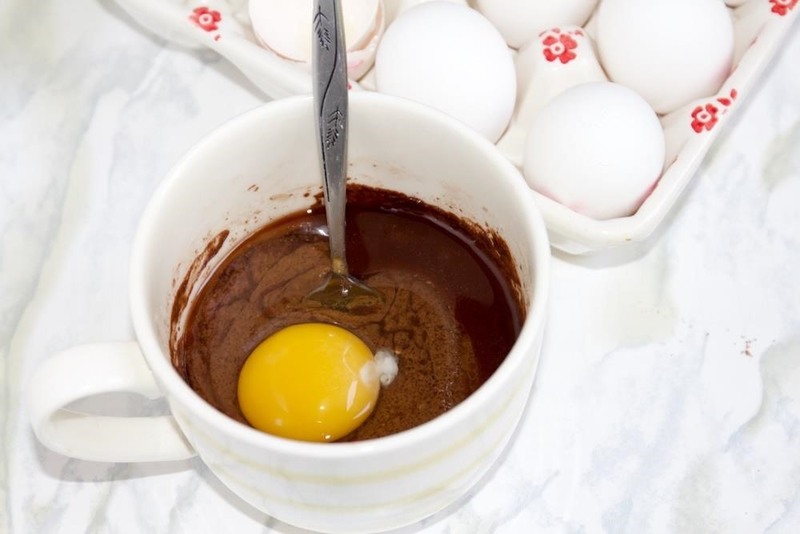 You can either mix the egg before adding it to the mug or add it to the mug directly—I prefer the latter, as it means less dirty dishes for me to clean. Stir everything well one more time, making sure nothing is stuck to the bottom of the mug. Use a fork instead of a spoon to stir your mix—it'll break apart the lumps better. 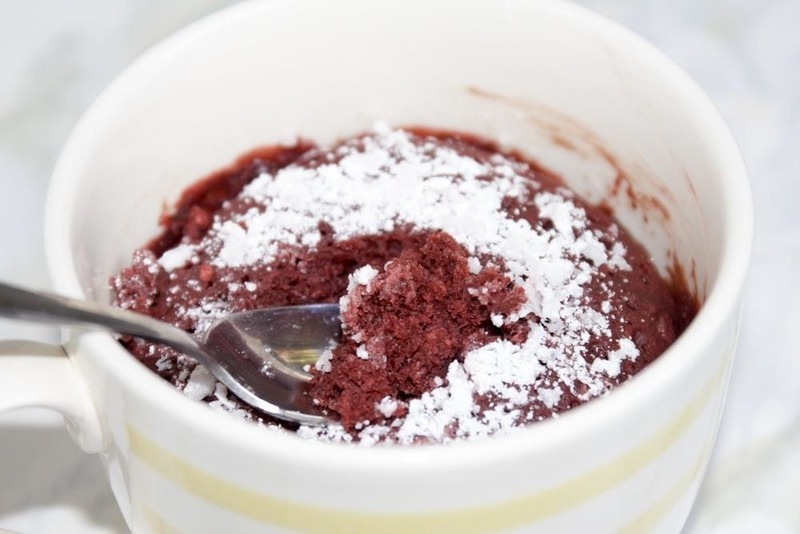 Mug cake can sell itself, but a molten center makes it even better. 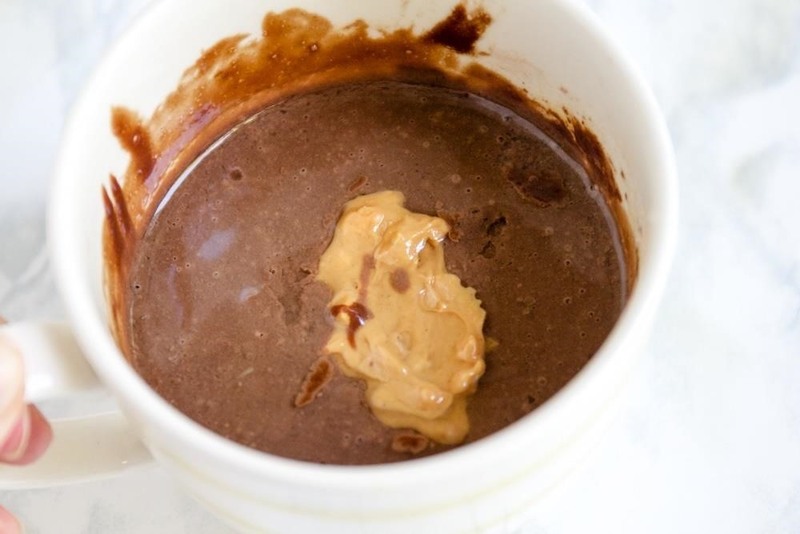 Drop chocolate chips, Nutella, or peanut butter into the center of the mug. Don't worry about pushing your blob of deliciousness into the batter—the filling sink into the center of the baking cake all on its own. This is a pretty important tip: a little water will prevent the top of your cake from over-baking and drying out (and becoming rubbery). Don't worry—it all evaporates in the microwave and ensures a perfect, moist texture every time. Use the time provided in your recipe as a guide, but keep in mind that each microwave is different, so it's going to take a little bit of practice to find your magic number. Once your cake is finished 'baking,' it should look slightly wet in the center. Test if it's done by gently touching the top with a few fingers: if they stick slightly, it's done. If your cake doesn't stick, you've nuked it a little too long. And if it's still completely wet, put it back in the microwave for 5-10 second increments until it reaches that perfect, slightly-sticky consistency. Now comes the best part... dig in and enjoy your rich cake and gooey, molten center! 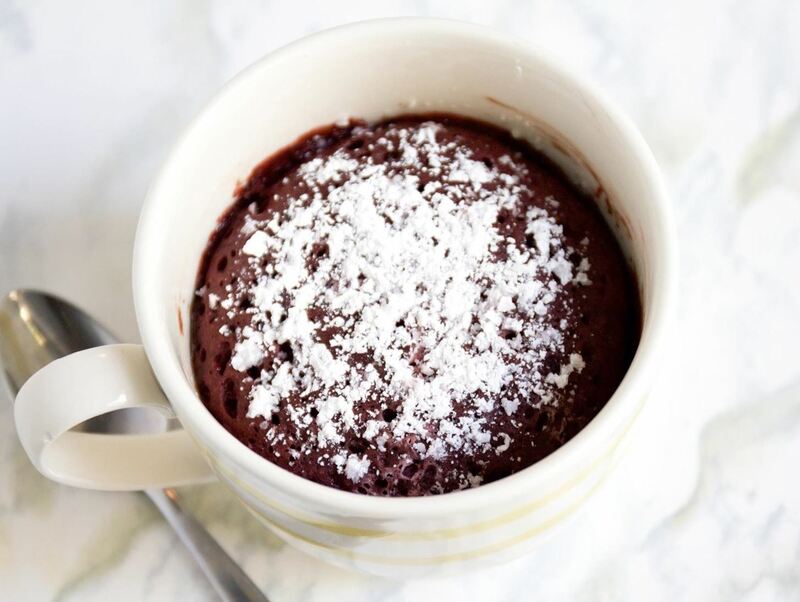 Share your go-to mug cake recipe or additional tips in the comments below.